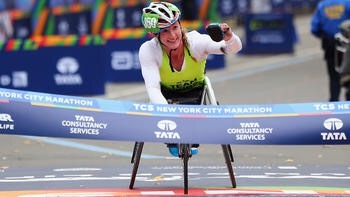 Tatyana McFadden has shattered the New York City Marathon women’s wheelchair course record in sweeping four major marathons for the third straight year. The 26-year-old American finished Sunday in 1 hour, 43 minutes, 4 seconds. She again completed the Grand Slam of winning in London, Boston, Chicago and New York, extending her record streak. The previous record of 1:50:24 was set by Amanda McGrory in 2011. Ernst Van Dyk of South Africa won his second NYC Marathon title and first since 2005 in the men’s race after finishing runner-up the last two years. He beat American Josh George by a second.